Lotto – Results for 5/4/18. Numbers drawn were 7, 10, 14, 19. No jackpot winner. Lucky dip winners were Gerry Mc Loughlin Mohill, Helen Bohan Eslin, Tom Mc Keon Cloone, George Booth Mohill. Next weeks draw is in Carrolls. Jackpot is €11,500. League – We had our first defeat of the league on Sunday against Manorhamilton, losing by 3 points. 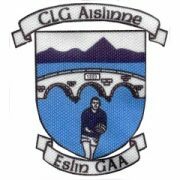 Our next game is Aughavas on Saturday at 7pm in Eslin. The Field – The very popular film ‘The Field’ was played out by the Eslin Dramatic Group over three nights last week. Huge crowds attended every night. It was very professionally performed and really enjoyable. Well done to everyone who took part and all the organisers on the nights.